Mabel at the Dutch state visit to the UK. I would liked this gown a little if it weren't for all the ribbon and ruffles. I'm not much of a floral print person but I like this fabric. Any information on the gorgeous jewelry? It's nice to see Mabel in color again. Kind and interested towards to the person next to her? Yes. Jewllery? Yes, absolutely suitable, she could have a little bigger tiara though. Dress? Burn it gurl, burn it!!!!!!!! I agree, Eve. Much as I love Mabel and seeing her in colors again, this dress was a real fail in design and fabric. I think she lives in London. 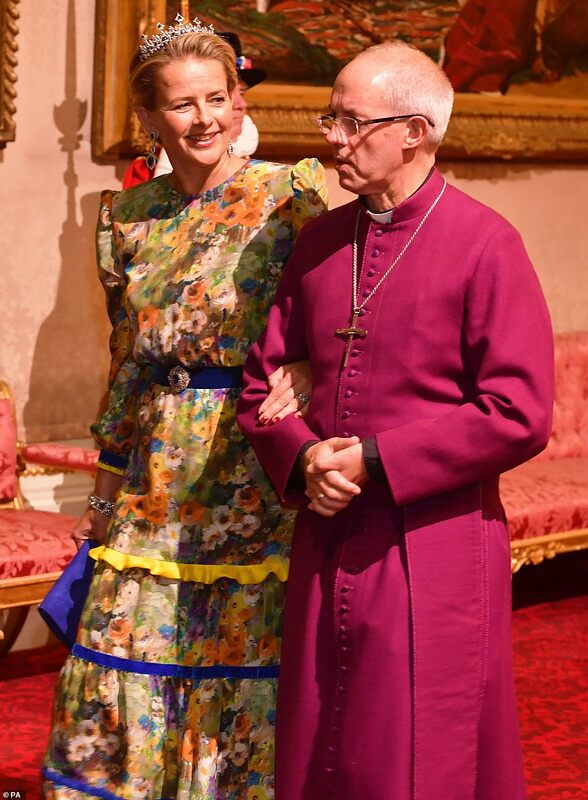 She could either be part of the official party or I believe it's normal to invite notable citizens from the guest country living in the host country or the Brits invited her because she is a Dutch royal living in London. Well, style was never one of Mabel's strong points. But she has loads of other qualities. I am convinced that dress comes from Beatrix, looks too familiar. 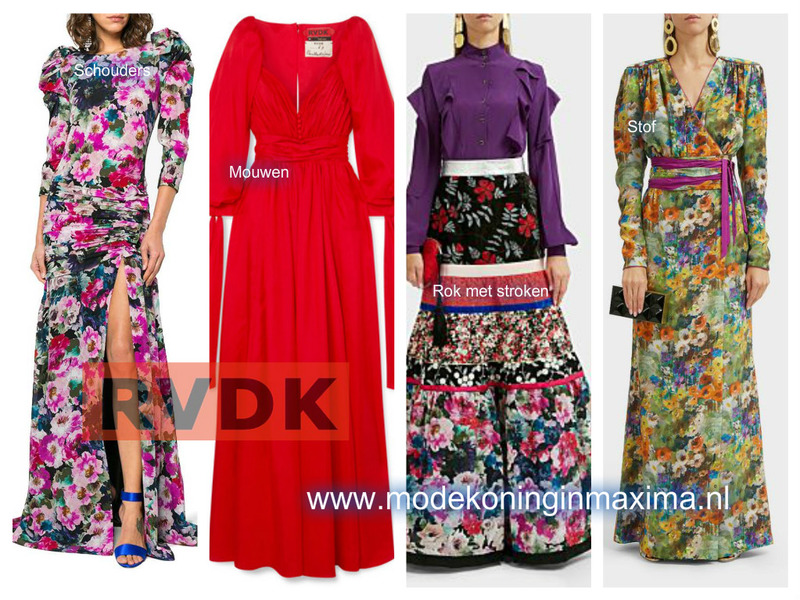 Modekoninginmaxima blog thinks it's a mix of various of his designs ... and the fabric is obviously one out of a current collection (right). The fabric reminds me much at Van Gogh's "Flowering Garden with Path"
but I find it too busy for a formal gown. The dress version on the far right looks all in all better than the bespoke she got (hate the ruffles/tiers), but would imho fit better for an outdoor summer occasion, but not for an indoor State Banquet end of October. I would never have thought that there is a designer who gives Natan a run for his money, but RVDK certainly has a weird taste and all of his creations above are really, really ... UGLY. 70ies, as you said, or early 80ies. Thank you for all that info Kaiserin! 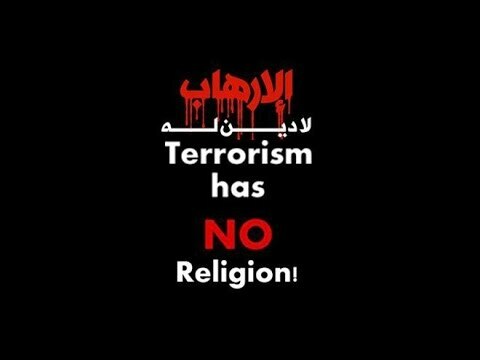 I've got to run, but wanted to say I totally agree with you re the bolded part.